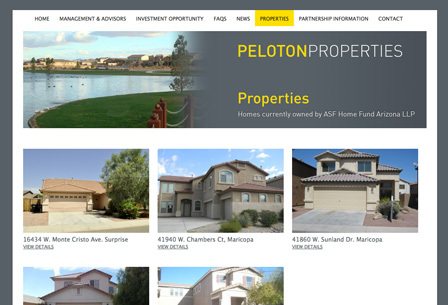 Peloton Properties has been founded to take advantage of the incredible opportunity that has been created by the collapse of the US economy, banking system and numerous US real estate markets. Historically, patient investors who acquire real estate at or near the bottom of market cycles have accumulated tremendous wealth. The founders of Peloton Properties believe that there will be a window that may last 2-4 years whereby investors will have the opportunity to participate in relatively low risk US based real estate ventures that will offer the potential for outstanding returns on investment.